For the Random Flow Generator to work, it must be fully submerged. Most All-in-One aquariums such as the Innovative Marine tanks, put the return nozzle right at the water line. This Slip-Fit-Drop Adapter solves this by dropping the nozzle below the water line just enough for proper operation. 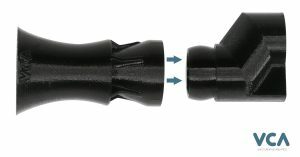 This easy to install 16mm to 1/2in Loc-line Slip-Fit- Drop Adapter allows you to easily adapt your all-in-one aquarium to use the 1/2in Random Flow Generator Nozzle. The Adapter is designed to replace the slip-on fitting that came with your tank and alloys you to properly position a Random Flow Generator. What size adapter do I need? Innovative Marine tanks have two possible sizes. a 19mm and a 16mm return line. Most JBJ tank have a 19mm return line. Use the image below to determine which size your tank has. The Slip-Fit-Drop adapter snaps together in seconds and is easy to install. To install the Adapter and RFG Nozzle assembly to your aquarium, simply remove the existing nozzle and slide the Slip-Fit-Drop adapter and Random Flow Generator Nozzle assembly in place. It;s that simple!.